Larry Libow was born and raised in Brooklyn, New York but has lived in Springfield, Massachusetts since graduating from Springfield College in 1971. Libow ran track at James Madison High School, Brooklyn, NY from 1963 to 1967 and briefly at Springfield College. He earns a living as a computer consultant. In 2007 he became a USA Track & Field Level I Coach and in 2010 he obtained his Level II coaching credentials in Youth Specialization. Libow is currently on the Board of Governors of the New England Association of USA Track and Field as the Youth Athletics Chair. He is also a USA Track & Field Coaches Registry Approved Coach. From 2007 to 2011 he was a volunteer coach for the Y-Speed Track Club for the YMCA of Greater Springfield. 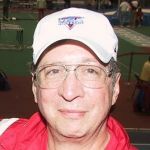 He has also served as a volunteer coach for the Springfield High School of Commerce Boys Track Team (2004 to 2012) and as Board member and President & CEO of the Massachusetts Senior Games, since 2003. Libow is the founder and former president of the Mass Velocity Track Club based in New England and continues to compete as a Master sprinter. Libow is the founder of the Howard Drew Springfield Mayor’s Cup All-City Track & Field Championships and Meet Director (2009-2011).